In the manufacturing process, a special flood reaction system using only water is able to produce large quantities of stabilised allicin. The liquid is then carefully dried, under controlled conditions, to maintain its potency. This sophisticated process has for the first time allowed us to capture garlic's active component in a form that can be used by the body. How Does AllicinMAX™ Differ from Garlic Supplements? Garlic supplements do not contain any allicin at all. They rely on your body being able to generate small quantities of allicin once you have swallowed the tablet or capsule. Garlic oil supplements are produced by distilling fresh garlic. The oil that is produced is then diluted and placed into a capsule. This process destroys most, if not all of the available allicin. A few garlic powder supplements can generate some allicin during the digestive process. This depends, however, on the prevailing stomach conditions and may take several hours. 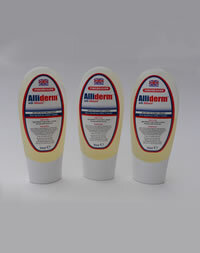 AllicinMAX™ doesn't need to be converted since it actually contains stabilised allicin. When AllicinMAX™ is taken, the allicin is not destroyed but is easily absorbed into the blood stream. The allicin in AllicinMAX™ likes the acid environment of your stomach, unlike other supplements that can be inactivated by acidic conditions. How Much AllicinMAX™ do I need? Just one to two capsules of AllicinMAX™ taken each day at mealtimes should provide enough allicin for your general health and well-being. However you may take up to 10 per day if necessary to increase the beneficial effect. AllicinMAX™ is not recommended for children under 3 years of age. If you are allergic, intolerant, or hypersensitive to garlic do not take AllicinMAX™ capsules. AllicinMAX™ is free from wheat, soy, dairy, gluten, yeast, salt, nuts, artificial flavours, colours and preservatives.